An unforgettable luxury experience with pickup from your hotel in the city center and comfortable transportation in a luxury minivan in a small group ranging from 2 to 7 people. A rich 3-course meal at a winery is included in which you will enjoy the typical gastronomy of Castille paired with its superb wine. Visit 3 fantastic wineries of the famous Ribera del Duero wine region with a guided tour at each of them to see wine production like you´ve never seen before. Ribera del Duero Designation of Origin is known for producing wines of the highest quality and on this tour, you will discover this for yourself. Enjoy a tasting session of 2-3 premium wines at each winery guided by the winery owner or winery expert. Be picked up from your hotel in central Madrid in the morning by your friendly expert guide to start your exclusive day tour from Madrid to one of the world’s most prestigious red wine regions. Known for its quality red wines of the Spanish grape called tempranillo, Ribera del Duero DO is just 2 hours from Madrid and a must-see destination for any wine lover. The group size ranges from 2 to 7 people ensuring that the experience is personal and memorable. Relaxing transportation in a luxury minivan will bring you to your first stop, a coffee break in Segovia next to its remarkable Roman aqueduct from the 1st century A.D.
You will continue your journey through Castile until you arrive at the renowned Ribera del Duero wine region, famous for producing some of the best red wines in the world. 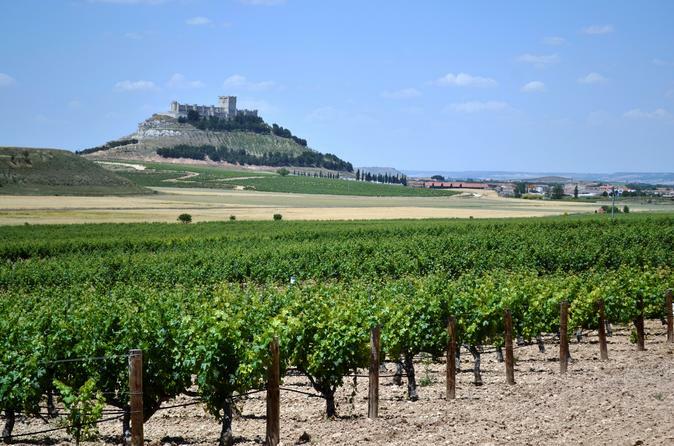 Our wine experts will have selected 3 fantastic wineries for you to enjoy Ribera del Duero no matter if you are a beginner or a wine connoisseur. You will visit a perfect mix of modern and traditional wineries and taste their most premium wines while discovering the history behind one of Spain’s most important wine regions. A wine professional or the owner himself will greet you at each winery to show you around the winery from where the grapes are received from the harvest to where the finished product is bottled and labelled for the final customer. You will learn about the wine-making process in Ribera del Duero from the experts as they share with you their passion for what they do. From centuries-old wine cellars to modern-day architecture, you will be amazed by the contrast in the wineries you visit while noticing similar values and a passion for sharing their wines with the world. The visit would certainly not be complete without the opportunity to taste the wines of each winery. Led by the expert, you will enjoy 3 guided wine tasting sessions of some of the most premium wines produced at each winery. Notice the site, aromas and taste of each wine as you compare and select your new favorite Spanish wine. An exclusive lunch will be enjoyed at one of the wineries where you will taste excellent local gastronomy. Enjoy 3 different courses paired with quality local wine in a truly remarkable atmosphere. With advanced notice, the meal can be adapted for vegetarians, food allergies or other dietary restrictions. After the third winery visit and tasting session of the day, you will head back to Madrid with your small group and be dropped off at your hotel. You will have enjoyed an 11-hour tour that will surely leave you with memories to last for a long time to come. Undoubtedly, you will return to your home country in search of wines from the remarkable Ribera del Duero D.O.